Our product range includes a wide range of acid absorption crystallizer (aac). 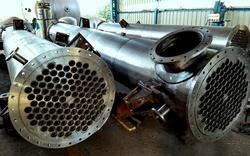 Acid Absorption Crystallizer, this technology uses low vapor pressure of Sulphuric Acid to generate high vacuum. By generating high vacuum, adiabatic evaporation is carried out for Crystallization and this is a unique technology developed by Jet Vacuum Systems Pvt. Ltd.